For a city that has re-invented itself as many times as Coventry, you would be forgiven for thinking that most of its historic sites or places of interest might have been lost. But while transformations, in particular those resulting from the Blitz, have certainly had their effect and significantly altered parts of the city, there are still numerous places of great interest to explore, including those that have been rediscovered or created in the process of 20th century change. Each phase has had its own distinctive style, and in particular the post war period included a celebration of modern art and architecture that is still evident across the city, though often regrettably overlooked. car-free shopping precinct and city ring road in the UK; a “millennium project” in the shape of an illuminating central plaza; a major city centre leisure development; and a modern multi-purpose football stadium. 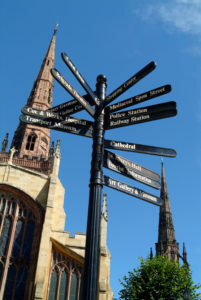 While Coventry has countless attractions and places of interest to suit all types of visitor, many of its treasures are well hidden, and the best way for those looking to uncover the riches of this compact city is to organise a walking tour with a Blue Badge Guide. A short walk from the visitor centre is the shell of the second Coventry Cathedral, destroyed in World War II. The remains of the 14th century Gothic structure sit next to the modernist Coventry Cathedral and provide a stark reminder of the indiscriminate and destructive nature of war. Visitors are able to walk through the ruins of the old cathedral, now a tranquil space in the centre of the city and home to a national memorial for Home Front volunteers of World War II, to the new structure at its far end. 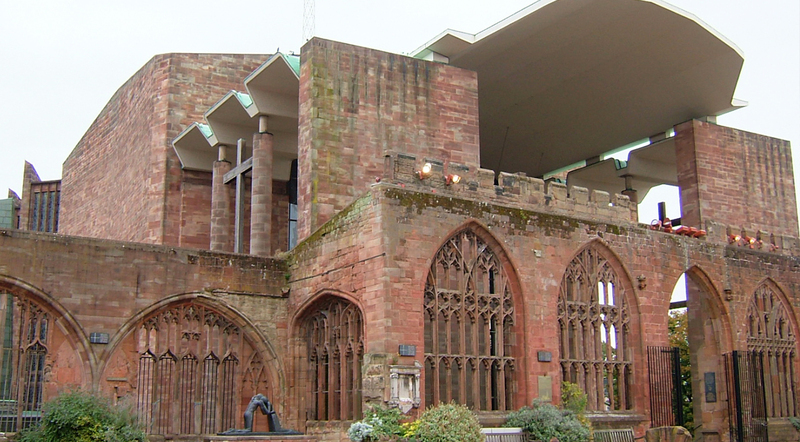 There have been three Coventry Cathedrals and the latest, designed by Basil Spence, was opened in 1962 after seven years in construction. The building is modernist in style, but is not overbearing and fits in well with its historic setting. It is faced with red Coventry sandstone, used in many buildings in the city, and its clever design, with zigzag walls and angled windows, allows natural light to be directed through the building. At the time, its style and the art pieces in the Cathedral were considered cutting edge, including engravings by John Hutton, a tapestry by Graham Sutherland, bronzes by Jacob Epstein and the magnificent stained glass window designed by John Piper. The post war years in which the new modernist Cathedral was built also provided something of a golden age for Coventry in terms of architecture, art and a sense of civic pride and identity, and role in the ‘new Britain’. Indeed, during this period Coventry was a city very much looking to the future and a series of highly symbolic public artworks were introduced to its urban landscape as a way of celebrating this newfound optimism. During your trip around the city you will see some distinctive works of art from this period, though some were moved to make way for new developments, and it is worth a walk that takes you past some of these. There are also more modern pieces on display in Coventry’s Canal Basin as part of the five and a half mile Coventry Canal Public Art Trail, showing the city is further developing this offer. Like its post war art and architecture, Coventry has a number of musical icons encompassing different genres. Delia Derbyshire, of the Radiophonic Workshop ‘Dr Who’ fame, The Specials, Badfinger and more recently The Enemy all hail from the city and its influence can be heard in much of their music. Moving on from the Cathedral area and heading towards the Herbert Art Gallery & History Museum, you could take the short walk along Priory Street with its mix of modern architecture and ancient ruins. The impressive and welcoming Herbert is located at the end of the street. The well designed covered courtyard which welcomes you as you enter the building is home to a working 19th century ribbon loom and leads to the History Centre, a treasure trove of information on the history of Coventry. The centre is open from Tuesday to Sunday and has a huge range of original documents, including books, maps, newspapers, electoral registers, photographs and building plans that illustrate the rich history of the city and the people who have lived here. The Herbert’s range of collections also cover Archaeology, Natural History, Social and Industrial History and Visual Arts. A short walk from the Herbert along Earl Street, headingtowards the High Street, is the Council House, a wonderfully presented early Tudor-style building withrich heraldic decoration, built between 1913-17. The Council House was opened later than planned, in 1920,due to the intervention of the First World War, but was worth the wait and its grand interior includes the impressive Council Chamber, which has been likened to a medieval courtroom. Far from appearing twee, the building has been designed with sympathy for its ancient surroundings and its quality design makes it a popular attraction, unlike a nearby unsympathetically designed building constructed in 2003, that it has the misfortune of being linked to by an orange brick bridge! There are a number of themed walking trails available and these include The Peace Trail, The 2tone Trail, Coventry Canal Public Art Trail, The George Eliot Trail and The Larkin Trail. Details of these and more can be obtained by contacting or visiting Coventry’s Tourist Information Centre. Coventry is easily accessible by coach, with good motorway links and the ring road. There are two convenient set down and pick up points in the centre, one on Priory Street at the foot of the cathedral steps, and the other on Hales Street next to the Transport Museum. Coach parking is also available at the museum and at White Street car park. The city is also well connected to the national rail network and the station is a short walk from the city centre. the world, located close to the city centre and other major attractions. The exhibits provide a fascinating insight into Coventry’s motor industry, but more than that, it also offers a wonderful insight into the city’s social history over the past 150 years. 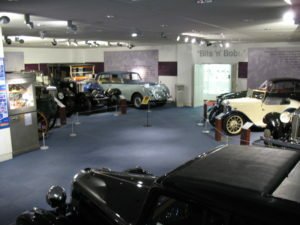 Coventry was the birthplace of the British cycle and motor industry, and the museum displays the world’s largest collection of British road transport. The exhibition is extensive and engaging and visitors can explore a century and a half of unique history in its galleries, with interactive displays and historic sets adding to the overall experience. The majority of the collection is Coventry built, or has a strong connection with the city, and includes the earliest British cars and cycles as well as iconic vehicles ranging from Queen Mary’s State Limousine to the 80s De Lorean ‘Back to the Future’ car. It’s well worth allowing an hour or more for a visit to the museum, which is well used to catering for groups and has a café offering group menus if booked in advance. As you will see from walking around the museum, Coventry was transformed by the motor industry and the box on page 52 provides further information about the impacts that it had on the city. designed £½ million structure that allows visitors to walk among the remains. Daily tours are available at £1 per person and GTOs may also book a guided tour at the Priory Visitor Centre. There have been three Coventry Cathedrals and the latest, designed by Basil Spence, was opened in 1962 after seven years in construction. The building is modernist in style, but is not overbearing and fits in well with its historic setting. It is faced with red Coventry sandstone, used in many buildings in the city, and its clever design, with zigzag walls and angled windows, allows natural light to be directed through the building. At the time, its style and the art pieces in the Cathedral were considered cutting edge, including engravings by John Hutton, a tapestry by Graham Sutherland, bronzes by Jacob Epstein and the magnificent stained glass window designed by John Piper. For visitors now, they represent a fascinating insight into mid 20th century British art. Group tours are available and include admission charge, but must be booked in advance through Coventry Cathedral’s booking officer. GTOs may wish to stop here for a break or a spot of lunch and the Cathedral’s undercroft restaurant, Benedict’s, is well used to catering for groups and can offer a ‘tour menu if pre-booked. The post war years in which the new modernist Cathedral was built also provided something of a golden age for Coventry in terms of architecture, art and a sense of civic pride and identity, and role in the ‘new Britain’. 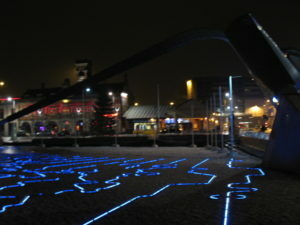 Indeed, during this period Coventry was a city very much looking to the future and a series of highly symbolic public artworks were introduced to its urban landscape as a way of celebrating this newfound optimism. During your trip around the city you will see some distinctive works of art from this period, though some were moved to make way for new developments, and it is worth a walk that takes you past some of these. There are also more modern pieces on display in Coventry’s Canal Basin as part of the five and a half mile Coventry Canal Public Art Trail, showing the city is further developing this offer. Like its post war art and architecture, Coventry has a number of musical icons encompassing different genres. Delia Derbyshire, of the Radiophonic Workshop ‘Dr Who’ fame, The Specials, Badfinger and more recently The Enemy all hail from the city and its influence can be heard in much of their music. They offer themes of interest to groups and further information about Coventry’s diverse musical history can be found in the box on page 53. Visitors to the city can also discover names of other well-known citizens on its ‘walk of fame’, located at Priory Place. available if booked in advance. post war redevelopments of the 1950s through to the 1970s. Some good examples of modernist architecture can be found in the area, including the old Owen Owen department store, now a Primark, designed by Helberg & Harris and the Leofric Hotel, now a TravelLodge, designed by W. S. Hattrell and Partners. Broadgate is also home to the first shopping precinct in the UK and while it is in need of some repair, it is an interesting place to visit for its quality post war architecture and is sadly often overlooked. The lower precinct has been recently redeveloped and has lost most of its original architecture, while other later developments around Broadgate, such as the Cathedral Lanes Shopping Centre built in 1989, have lacked the quality of earlier buildings and detracted from the flavour of what is an important site for 20th century urban development. Nevertheless, there are still some fascinating sites and buildings for those with an interested in modernist architecture to enjoy and some are detailed in the box opposite. After enjoying an hour or so wandering around the shopping area and taking in the architectural styles or retail experience, you may wish to walk along Trinity Street back towards the Cathedral area and stop at the Holy Trinity Church. The church was founded in the 12th century and was the place of worship for the author George Eliot, another famous past resident of Coventry. One of the main reasons for visiting the church is to view the renowned ‘doom painting’, located on a wall above one of the arches. The painting has been recently restored and is a remarkable 15th century mural depicting judgement, blessing and damnation. Entry to the church is free of charge, but donations can be made to help maintain the building. With so much to offer, and a great many more places to visit than can possibly be covered in a single day, GTOs may wish to arrange an overnight stay in one of the many hotels conveniently close to the city centre that are well able to cater for large parties. Those staying overnight or into the evening could also enjoy a walk around the cathedral area as night falls, both for the evocation of the wartime Blitz and the tranquillity of a past age. The areas around Trinity Church and along Priory Row are particularly atmospheric at this time of the day and a walk past the Georgian houses and old street lamps takes you back to yet another period in the city’s past. For those choosing to spend more than a day exploring the city, other places well worth a visit include The Ford Hospital, an almshouse which was founded in 1509 and lies hidden behind more modern buildings on Greyfriar’s Lane; the Canal Basin, a tranquil area left behind by the industrial revolution where old warehouses meet craft shops; The Belgrade Theatre, with its range of shows; or even the large Ikea store, which is located in the city centre. While Coventry is not nearly as well known for its historic sites and attractions as other major cities in the UK, it has a large and varied offer relating to its unique place in British history and is very easy to explore. Those groups that make the effort to walk its streets and uncover its treasures will be richly rewarded with some unique and memorable experiences.